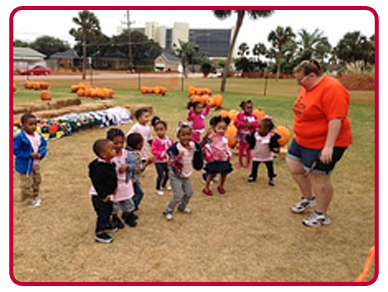 Come to Early Leaders Childcare in Pearland, TX for low prices on child care. Early Leaders Childcare top priority is to provide the highest quality of childcare. We believe that every child deserves to learn in their own unique way. Our goal is to provide the best possible care for your child(ren) in a safe environment to grow and learn the years to come. As time goes by your child will come to trust and gain confidence in their teacher along with their peers in the same group throughout the year. Teachers interact with children in a loving, respectful way in which they would their own children. All staff are trained and certified in CPR and First Aid. We provide care for 6weeks- 12years old. We have two locations in Texas. Our centers are located in La Marque, Texas. Stop by one of our locations. Where affordable daycare is not expensive it's "Priceless"
We can provide our services to children from six weeks old all the way to 12 years old. Bring your children to us, and you can be sure that they will be well taken care of. Put your children in the care of someone you can trust. We are a family ourselves! Come let your children be around people their own age, and start developing those much needed social skills.